Nobody comes to Times Square in search of quality handicrafts — yet you’ll find, in Fiasco Theater’s Cymbeline, a small masterpiece whittled out of driftwood, nestled casually at the feet of Spider-Man. (It’s right next door, yet also millions of miles away.) With a minimalist lighting-design, a handful of props, and a set that could be (and probably has been) stored in a starving actor’s studio apartment, the Fiasco company — a six-person troupe that includes Bloody Bloody Andrew Jackson veterans Ben Steinfeld and Emily Young — brings joyful music, playful inventiveness, and just an air-kiss of irony to Shakespeare’s much-mocked mock-epic. (The unclassifiable Cymbeline is renowned chiefly for its tangled, tangential plots and subplots, roughly two dozen of them, all of which are mass-resolved in a mosh-pit finale so amused with its own egregious Scooby-Doo-ness that an exasperated George Bernard Shaw famously rewrote it. Fiasco’s taken a judicious knife to it, too, but their additions are musical, not textual.) In just two and half hours, Fiasco (produced at the New Victory by Theater for a New Audience) reminds us what theater, at its simplest and most powerful, is really for: the alchemical thrill of watching an entire world conjured into being out of sheer wit and will. It helps, I guess, that Fiasco consists of wall-to-wall polymaths: Co-directors Steinfeld and Noah Brody also act, playing the villainous seducer/manipulator Iachimo and the pouty male lead Posthumus, respectively. Steinfeld arranges the music (a billowing quilt of Thomas Tallis, Carter Stanley, and startlingly catchy folk-pop originals), plays a mean bluegrass guitar, and lends his substantial voice to the cast’s rich, oaky harmonies. Brody designs and oversees the zinging fight choreography. Jessie Austrian, who co-conceived the production, plays a winning Imogen, the feisty Briton princess who marries lowly Posthumus for love, angers her father King Cymbeline (Andy Grotelueschen), and suffers the near-fatal jealousy of her husband and the dangerous machinations of her evil stepmother. (That’s Young, whose double-jointed eyebrows belong in a museum of rare expressiveness. Oh yeah, she sings, too: She anchors a whole Carter Family–style band, in fact.) Groteleuschen doubles as the thuggish dunce Cloten, the step-queen’s violent lout of a son: With little more than a tug at his vest, this fine comic actor can send ripples of laughs through the audience, yet never drops his menace. (Ten, fifteen years from now, look for this guy’s Falstaff: It’ll be a doozy. And did I mention he plays the ukulele?) And then there’s Paul Coffey, whose intricate, interior take on Posthumus’s tortured manservant Pisanio pops against the broader (though never hammy) performances that dominate here. (He also plays the banjo — and three other roles.) By the end, Fiasco’s crammed their wooden O with a war, two colliding empires, countless intrigues, and one ingeniously staged beheading. Magically, it’s all kept lucid, clear, and fleet-of-foot — the tempo never flags. Cymbeline is a night of delights made of stuff you could buy for a song at Brooklyn Flea. All except the talent, of course. 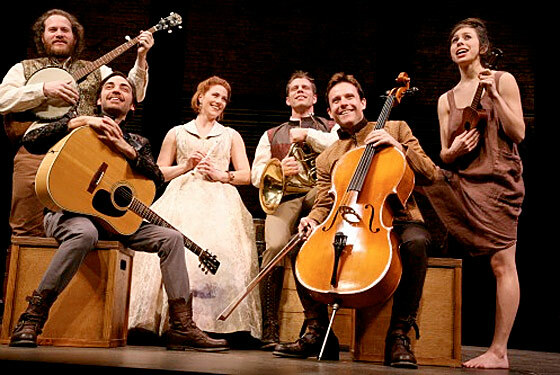 Cymbeline is running through January 30 at the New Victory Theater.